Amateur photographer Chris Van Wyk couldn’t believe his luck when he captured the Mary River Turtle on film while it was quietly wading in the Mary River near Kenilworth. The turtle has become popular in recent times because environmentalists say the already endangered turtle is being further threatened by the State Government’s announcement to build a dam on the Mary River. The Government says the Traveston Dam will improve the water supply for the rest of south-east Queensland including Brisbane and the Gold Coast. But parties opposing the dam say wildlife could be drastically affected and dams are expensive and unreliable. If you’re wondering… That green mohawk hairdo is just algae growing on the turtles’ head. 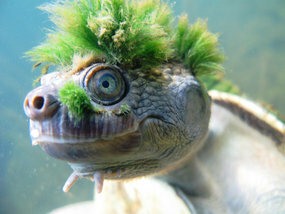 That is the cutest reptile I have ever seen, but how could a turtle breath through its tail? i dont blam you .i dont konw what it is about ethougher.